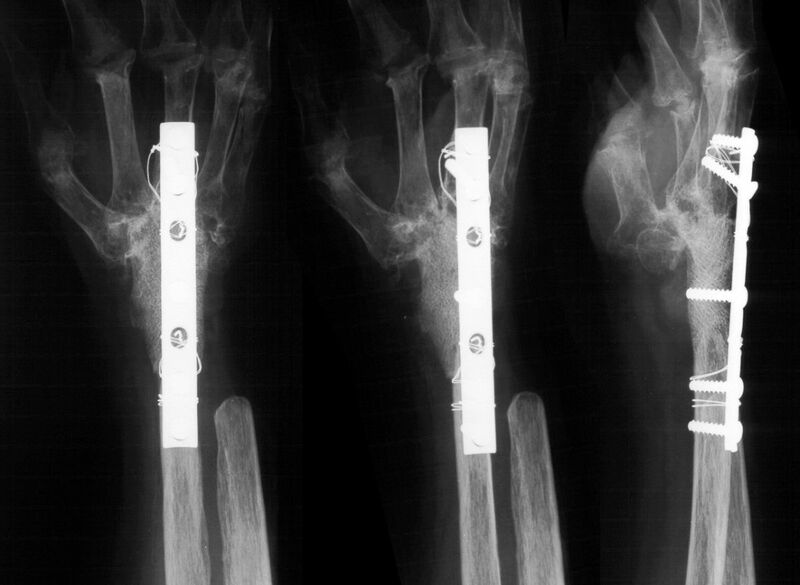 Barring complications, patients are more satisfied with wrist arthroplasty than arthrodesis. 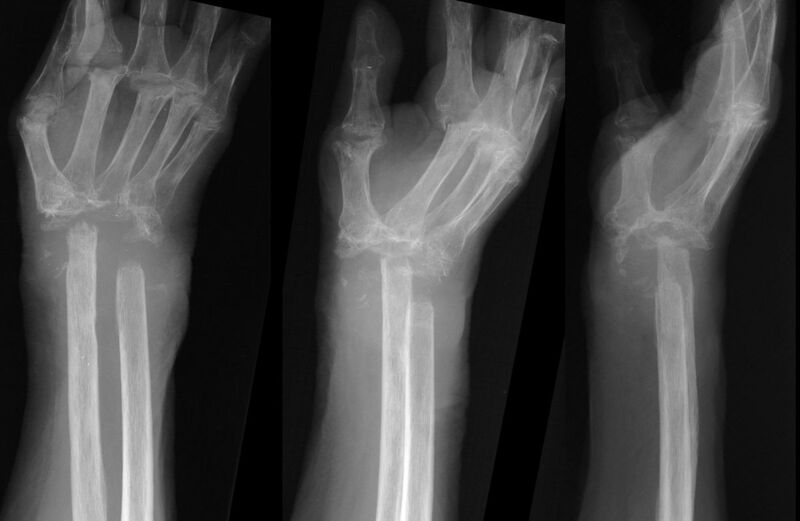 Bilateral involvement is common, multiplying the effect of choice of procedure. 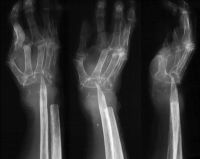 Rheumatoid bone stock is poor, dramatically increasing the risk of wrist implant arthroplasty failure. 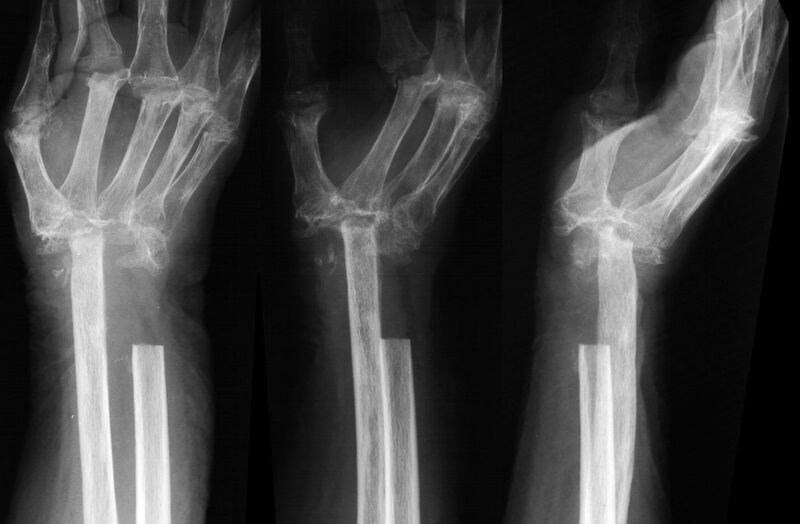 Wrist arthrodesis with intercalated bone graft is a recognized salvage for failed wrist arthroplasty. In rheumatoid patients, allograft may have better quality than iliac crest autograft. 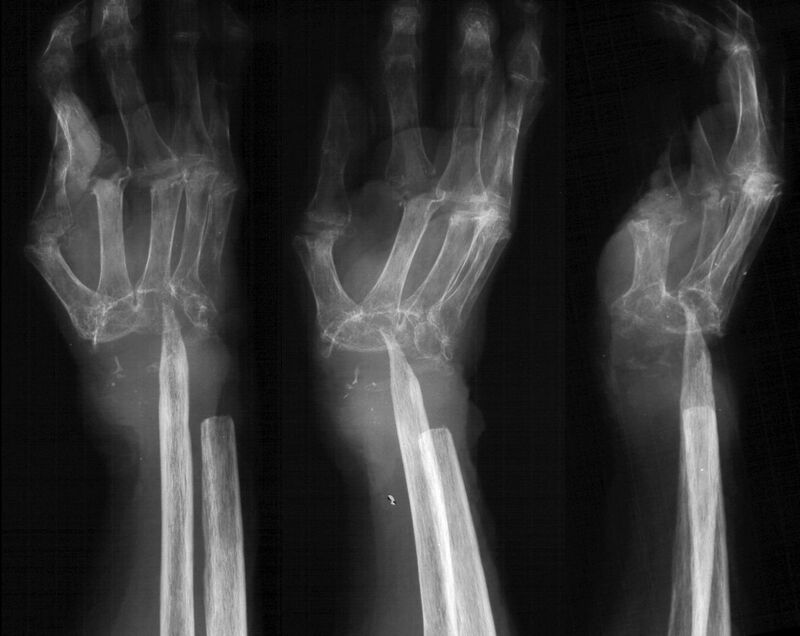 This case demonstrate the use of fresh frozen femoral head allograft, plate fixation augmented with cerclage in a salvage procedure for failed wrist arthroplasty for rheumatoid arthritis. She was treated with splinting, and responded well. 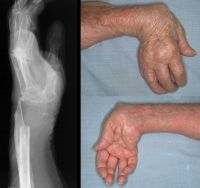 However, she returned four months later with a draining sinus from the distal ulna and evidence of osteomyelitis. She was treated with radical resection of the infected bone. Intraoperative cultures grew out normal skin flora and she received 6 weeks of appropriate intravenous antibiotics. There was no cinical evidence of residual infection. She maintained a functional range of motion from her pseudoarthrosis and did not wish to have any more surgery. 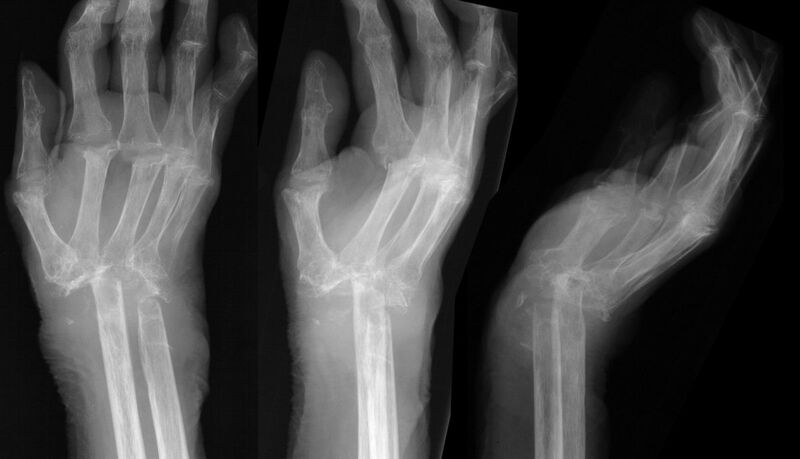 Four years later, she complained of wrist instability, and xrays confirmed intermittent radiometacarpal dislocation. 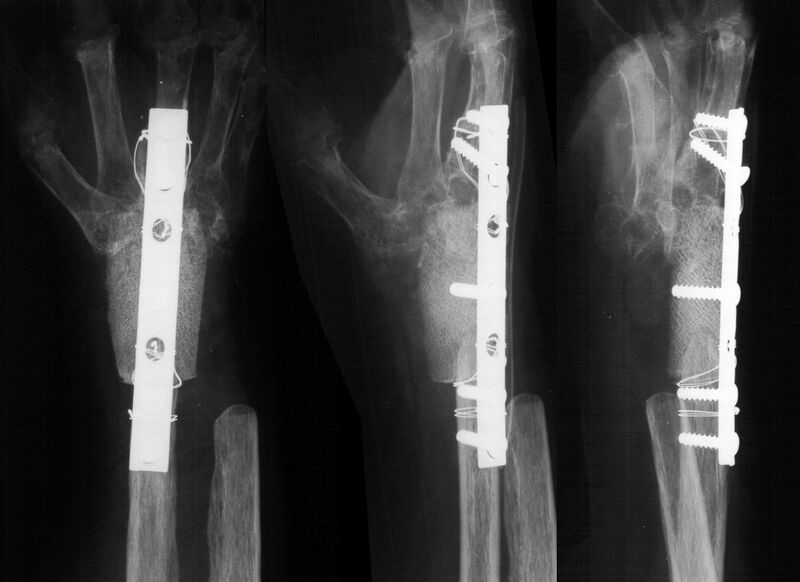 She was treated with wrist arthodesis, using a sculpted fresh frozen femoral head allograft and a cerclage reinforced plate and screw fixation. Late result, showing graft incorporation and remodelling.